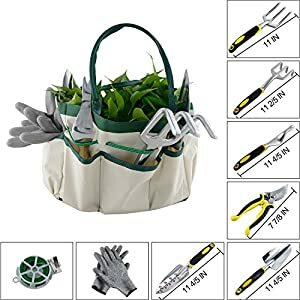 9 PIECES GARDEN TOOL SETS: Including a pruner, weeder, trowel, cultivator, weeding fork, transplanter, plant rope, and a pair of cut-resistant gloves, a tote. Perfect for all kinds of gardening tasks like weeding, digging, transplanting, pruning, loosening soil etc. HIGH QUALITY BLADES & TINES: tools are made of solid polished aluminum, which are shiny, rust-proof, long lasting, do not snap easily and extremely sturdy. NEWEST VERSION SETS: Including a plant rope, which can be used to fasten plant or flowers. A 5 levels cut-resistant gloves; breathable and anti-cutting protect hands from scraps and cuts.Especially soft contoured handle helps reduce hand fatigue during use. Portable tote bag with 9 pockets, suitable to keep seeds, fertilizer, tools sorted and organized. 345 queries in 1.262 seconds.